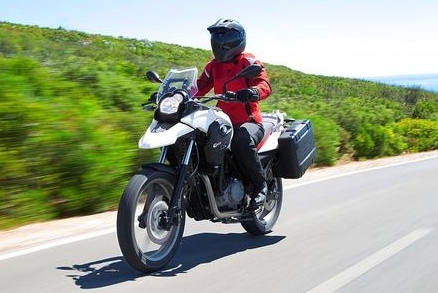 Rider magazine just posted their review of the 2011 BMW G650GS. Main changes from previous models include; all-new bodywork, a taller windscreen, a re-done instrument panel, a narrower midsection (thanks to a smaller underseat fuel tank) and the wheels are now cast aluminum with tubeless tires. Other notable changes include a redesigned handlebar that lacks the motocross-style cross member and the absence of bashplate. Overall they felt the bike was somewhat less dirt-worthy than previous models. Unchanged is the 652cc, EFI, liquid-cooled single-cylinder engine producing 43.4 horsepower at 7,300 rpm and 37.7 lb-ft of torque at 5,000 rpm. They averaged 57.3 mpg in their overall test (48.6 mpg offroad, 64.2 mpg highway) so the 3.7-gallon tank is good for well over 200 miles. The base price of the 2011 is $7,350 (a few hundred bucks less than last year’s), but BMW has moved some of the standard features to options, so a careful comparison is required. Production of the 2012 G650 GS began in August. See the full review at ridermagazine.com.